For other uses, see Restaurant (disambiguation). A restaurant (French: [ʁɛstoʁɑ̃] ( listen)), or an eatery, is a business which prepares and serves food and drinks to customers in exchange for money. Meals are generally served and eaten on the premises, but many restaurants also offer take-out and food delivery services. Restaurants vary greatly in appearance and offerings, including a wide variety of cuisines and service models ranging from inexpensive fast food restaurants and cafeterias to mid-priced family restaurants, to high-priced luxury establishments. In Western countries, most mid- to high-range restaurants serve alcoholic beverages such as beer and wine. Some restaurants serve all the major meals, such as breakfast, lunch, and dinner (e.g., major fast food chains, diners, hotel restaurants, and airport restaurants). Other restaurants may only serve a single meal (for example, a pancake house may only serve breakfast) or they may serve two meals (e.g., lunch and dinner). The word derives from the French verb “restaurer” (“to restore”, “to revive”) and, being the present participle of the verb, it literally means “that which restores”. The term restaurant was defined in 1507 as a “restorative beverage”, and in correspondence in 1521 to mean “that which restores the strength, a fortifying food or remedy”. 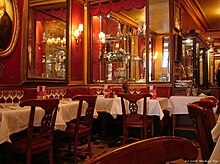 The “first real restaurant” is considered to have been “La Grande Taverne de Londres” in Paris, founded by Antoine Beauviliers in either 1782 or 1786. According to Brillat-Savarin, this was “the first to combine the four essentials of an elegant room, smart waiters, a choice cellar, and superior cooking”. In 1802 the term was applied to an establishment where restorative foods, such as bouillon, a meat broth, were served (“établissement de restaurateur”). Restaurants range from inexpensive and informal lunching or dining places catering to people working nearby, with modest food served in simple settings at low prices, to expensive establishments serving refined food and fine wines in a formal setting. In the former case, customers usually wear casual clothing. In the latter case, depending on culture and local traditions, customers might wear semi-casual, semi-formal or formal wear. Typically, at mid- to high-priced restaurants, customers sit at tables, their orders are taken by a waiter, who brings the food when it is ready. After eating, the customers then pay the bill. In some restaurants, such as workplace cafeterias, there are no waiters; the customers use trays, on which they place cold items that they select from a refrigerated container and hot items which they request from cooks, and then they pay a cashier before they sit down. Another restaurant approach which uses few waiters is the buffet restaurant. Customers serve food onto their own plates and then pay at the end of the meal. Buffet restaurants typically still have waiters to serve drinks and alcoholic beverages. Fast food restaurants are also considered a restaurant. The travelling public has long been catered for with ship’s messes and railway restaurant cars which are, in effect, travelling restaurants. Many railways, the world over, also cater for the needs of travellers by providing railway refreshment rooms, a form of restaurant, at railway stations. In the 2000s, a number of travelling restaurants, specifically designed for tourists, have been created. These can be found on trams, boats, buses, etc. A restaurant’s proprietor is called a restaurateur, this derives from the French verb restaurer, meaning “to restore”. Professional cooks are called chefs, with there being various finer distinctions (e.g. sous-chef, chef de partie). Most restaurants (other than fast food restaurants and cafeterias) will have various waiting staff to serve food, beverages and alcoholic drinks, including busboys who remove used dishes and cutlery. In finer restaurants, this may include a host or hostess, a maître d’hôtel to welcome customers and to seat them, and a sommelier or wine waiter to help patrons select wines. A new route to becoming a restauranter, rather than working one’s way up through the stages, is to operate a food truck. Once a sufficient following has been obtained, a permanent restaurant site can be opened. This trend has become common in the UK and the US. “Chef’s table” redirects here. For the Netflix documentary series, see Chef’s Table. 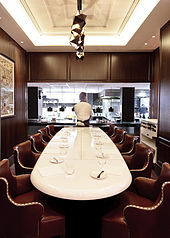 A chef’s table is a table located in the kitchen of a restaurant, reserved for VIPs and special guests. Patrons may be served a themed tasting menu prepared and served by the head chef. Restaurants can require a minimum party and charge a higher flat fee. Because of the demand on the kitchen’s facilities, chef’s tables are generally only available during off-peak times. The people of Hangzhou are very difficult to please. Hundreds of orders are given on all sides: this person wants something hot, another something cold, a third something tepid, a fourth something chilled; one wants cooked food, another raw, another chooses roast, another grill. The restaurants in Hangzhou also catered to many northern Chinese who had fled south from Kaifeng during the Jurchen invasion of the 1120s, while it is also known that many restaurants were run by families formerly from Kaifeng. In Ancient Greece and Ancient Rome, thermopolia (singular thermopolium) were small restaurant-bars that offered food and drinks to customers. A typical thermopolium had L-shaped counters in which large storage vessels were sunk, which would contain either hot or cold food. Their popularity was linked to the lack of kitchens in many dwellings and the ease with which people could purchase prepared foods. Furthermore, eating out was considered an important aspect of socializing. In Pompeii, 158 thermopolia with service counters have been identified throughout the town. They were concentrated along the main axis of the town and the public spaces where they were frequented by the locals. Sign of the old cabaret Au petit Maure. The French Revolution caused a mass emigration of nobles, and many of their cook chose to open restaurants. One restaurant was started in 1791 by Méot, the former chef of the Duke of Orleans, which offered a wine list with twenty-two choices of red wine and twenty-seven of white wine. By the end of the century there were a collection of luxury restaurants at the Grand-Palais: Huré, the Couvert espagnol; Février; the Grotte flamande; Véry, Masse and the Café de Chartres (still open, now Le Grand Vefour). In the early 19th century traiteurs and restaurateurs, became known simply as “restaurateurs”. The use of the term “restaurant” for the establishment itself only became common in the nineteenth century). In the United States, it was not until the late 18th century that establishments that provided meals without also providing lodging began to appear in major metropolitan areas in the form of coffee and oyster houses. The actual term “restaurant” did not enter into the common parlance until the following century. Prior to being referred to as “restaurants” these eating establishments assumed regional names such as “eating house” in New York City, “restorator” in Boston, or “victualing house” in other areas. Restaurants were typically located in populous urban areas during the 19th century and grew both in number and sophistication in the mid-century due to a more affluent middle class and to suburbanization. The highest concentration of these restaurants were in the West, followed by industrial cities on the Eastern Seaboard. In the 1970s, there was one restaurant for every 7,500 persons. In 2016, there were 1,000,000 restaurants; one for every 310 people. The average person eats out five to six times weekly. 10% of the nation’s workforce is composed of restaurant workers. In Brazil, restaurants varieties mirrors the multitude of nationalities that arrived in the country: Japanese, Arab, German, Italian, Portuguese and many more. In Colombia, a piqueteadero is a type of casual or rustic eatery. Meals are often shared, and typical offerings include dishes such as chorizo, chicharron, fried organs, fried yuca, maduro and corn on the cob. Customers order the foods they want and the prepared foods are served together on a platter to be shared. The word piquete can be used to refer to a common Colombian type of meal that includes meat, yuca and potatoes, which is a type of meal served at a piqueteaderos. The verb form of the word piquete, piquetear, means to participate in binging, liquor drinking, and leisure activities in popular areas or open spaces. In Peru, many indigenous, Spanish, and Chinese dishes are frequently found. Because of recent immigration from places such as China, and Japan, there are many Chinese and Japanese restaurants around the country, especially in the capital city of Lima. Restaurant guides review restaurants, often ranking them or providing information to guide consumers (type of food, handicap accessibility, facilities, etc.). One of the most famous contemporary guides is the Michelin series of guides which accord from 1 to 3 stars to restaurants they perceive to be of high culinary merit. Restaurants with stars in the Michelin guide are formal, expensive establishments; in general the more stars awarded, the higher the prices. In the United States, the Forbes Travel Guide (previously the Mobil travel guides) and the AAA rate restaurants on a similar 1 to 5 star (Forbes) or diamond (AAA) scale. Three, four, and five star/diamond ratings are roughly equivalent to the Michelin one, two, and three star ratings while one and two star ratings typically indicate more casual places to eat. In 2005, Michelin released a New York City guide, its first for the United States. The popular Zagat Survey compiles individuals’ comments about restaurants but does not pass an “official” critical assessment. FreshNYC recommends plausible New York City restaurants for busy New Yorkers and visitors alike. The Good Food Guide, published by the Fairfax Newspaper Group in Australia, is the Australian guide listing the best places to eat. Chefs Hats are awarded for outstanding restaurants and range from one hat through three hats. The Good Food Guide also incorporates guides to bars, cafes and providers. The Good Restaurant Guide is another Australian restaurant guide that has reviews on the restaurants as experienced by the public and provides information on locations and contact details. Any member of the public can submit a review. Nearly all major American newspapers employ food critics and publish online dining guides for the cities they serve. Some news sources provide customary reviews of restaurants, while others may provide more of a general listings service. More recently Internet sites have started up that publish both food critic reviews and popular reviews by the general public. Many restaurants are small businesses, and franchise restaurants are common. There is often a relatively large immigrant representation, reflecting both the relatively low start-up costs of the industry (thus making restaurant ownership an option for immigrants with relatively few resources) and the cultural importance of food. Fully 63% of restaurants in Canada are independent brands. Chain restaurants account for the remaining 37%, and many of these are locally owned and operated franchises. The EU-27 has an estimated 1.6m businesses involved in ‘accommodation & food services’, more than 75% of which are small and medium enterprises. Workers in the kitchen at Delmonico’s Restaurant, New York, 1902. As of 2006, there are approximately 215,000 full-service restaurants in the United States, accounting for $298 billion in sales, and approximately 250,000 limited-service (fast food) restaurants, accounting for $260 billion. Starting in 2016, Americans spent more on restaurants than groceries. In October 2017, The New York Times reported there are 620,000 eating and drinking places in the United States, according to the Bureau of Labor Statistics. They also reported that the number of restaurants are growing almost twice as fast as the population. One study of new restaurants in Cleveland, Ohio found that 1 in 4 changed ownership or went out of business after one year, and 6 out of 10 did so after three years. (Not all changes in ownership are indicative of financial failure.) The three-year failure rate for franchises was nearly the same. Restaurants employed 912,100 cooks in 2013, earning an average $9.83 per hour. The waiting staff numbered 4,438,100 in 2012, earning an average $8.84 per hour. Dining in restaurants has become increasingly popular, with the proportion of meals consumed outside the home in restaurants or institutions rising from 25% in 1950 to 46% in 1990. This is caused by factors such as the growing numbers of older people, who are often unable or unwilling to cook their meals at home and the growing number of single-parent households. It is also caused by the convenience that restaurants can afford people; the growth of restaurant popularity is also correlated with the growing length of the work day in the US, as well as the growing number of single parent households. Eating in restaurants has also become more popular with the growth of higher income households. At the same time, less expensive establishments such as fast food establishments can be quite inexpensive, making restaurant eating accessible to many. The restaurant industry in the United States is large and quickly growing, with 10 million workers. 1 in every 12 U.S. residents work in the business, and during the 2008 recession, the industry was an anomaly in that it continued to grow. Restaurants are known for having low wages, which they claim are due to thin profit margins of 4-5%. For comparison, however, Walmart has a 1% profit margin. As a result of these low wages, restaurant employees suffer from three times the poverty rate as other U.S. workers, and use food stamps twice as much. Restaurants also employ marginalized groups. They are the largest employer of people of color. Restaurants rank as the second largest employer of immigrants. These workers statistically are concentrated in the lowest paying positions in the restaurant industry. In the restaurant industry, 39% of workers earn minimum wage or lower. In many countries, restaurants are subject to inspections by health inspectors to maintain standards for public health, such as maintaining proper hygiene and cleanliness. As part of these inspections, cooking and handling practices of ground beef are taken into account to protect against the spread of E coli poisoning. The most common kind of violations of inspection reports are those concerning the storage of cold food at appropriate temperatures, proper sanitation of equipment, regular hand washing and proper disposal of harmful chemicals. Simple steps can be taken to improve sanitation in restaurants. As sickness is easily spread through touch, restaurants are encouraged to regularly wipe down tables, door knobs and menus. Depending on local customs and the establishment, restaurants may or may not serve alcoholic beverages. Restaurants are often prohibited from selling alcoholic beverages without a meal by alcohol sale laws; such sale is considered to be activity for bars, which are meant to have more severe restrictions. Some restaurants are licensed to serve alcohol (“fully licensed”), or permit customers to “bring your own” alcohol (BYO / BYOB). In some places restaurant licenses may restrict service to beer, or wine and beer. ^ Prosper Montagné. “The New Larousse Gastronomique”. Éditions Larousse. p. 97. Retrieved February 22, 2019. ^ Jean Anthelme Brillat-Savarin (April 5, 2012). The Physiology of Taste. Courier Corporation. pp. 226–. ISBN 978-0-486-14302-6. ^ Paul H. Freedman; Professor Paul Freedman (2007). Food: The History of Taste. University of California Press. pp. 305–. ISBN 978-0-520-25476-3. ^ Edward Glaeser (February 10, 2011). Triumph of the City: How Our Greatest Invention Makes Us Richer, Smarter, Greener, Healthier, and Happier. Penguin Publishing Group. pp. 88–. ISBN 978-1-101-47567-6. ^ “Etymology of Cabaret” (in French). Ortolong: site of the Centre National des Resources Textuelles et Lexicales. Retrieved January 12, 2019. ^ “Marcus”. Accessed May 21, 2015. ^ Ford, Elise Hartman (2006). Frommer’s Washington, D.C. 2007, Part 3. 298. John Wiley and Sons. p. 162. ISBN 978-0-470-03849-9. ^ Blackwell, Elizabeth Canning (2008). Frommer’s Chicago 2009. 627. Frommer’s. p. 123. ISBN 978-0-470-37371-2. ^ a b Brown, Monique R. (January 2000). “Host your own chef’s table”. Black Enterprise: 122. ^ Ford, Elise Hartman; Clark, Colleen (2006). D.C. night + day, Part 3. ASDavis Media Group. p. 25. ISBN 978-0-9766013-4-0. ^ Miller, Laura Lea (2007). Walt Disney World & Orlando For Dummies 2008. For Dummies. p. 157. ISBN 978-0-470-13470-2. ^ Brown, Monique R. (January 2000). “New spin on dining: Hosting a chef’s table can wow guests”. Black Enterprise: 122. ^ a b c Fierro, p. 737. ^ a b Chevallier, pg. 67-80. ^ a b c d e Fierro 1996, p. 1137. ^ Early Restaurants in America. ^ Leonard, Suzy Fleming (October 2, 2016). “Refining fine dining”. Florida Today. Melbourne, Florida. pp. 1A, 6A, 7A. Retrieved October 12, 2016. ^ a b Eater, Bogotá (June 8, 2009). “BOGOTÁ EATS & DRINKS: Piqueteadero “El Chorote““. ^ “Per Se American (New), French”. Zagat. Retrieved April 29, 2013. ^ “Things to do in NYC”. FreshNYC. Retrieved August 1, 2015. ^ “Best Modern Australian Restaurants in Melbourne”. Accessed September 25, 2016. ^ “Business economy – size class analysis – Statistics Explained”. Epp.eurostat.ec.europa.eu. Retrieved May 2, 2013. ^ 2006 U.S. Industry & Market Outlook by Barnes Reports. ^ Phillips, Matt (June 16, 2016). “No one cooks anymore”. Quartz (publication). Retrieved April 5, 2017. ^ Abrams, Rachel; Gebeloff (October 31, 2017). “Thanks to Wall St., There May Be Too Many Restaurants”. The New York Times. Retrieved November 1, 2017. ^ Kerry Miller, “The Restaurant Failure Myth”, Business Week, April 16, 2007. Cites an article by H.G. Parsa in Cornell Hotel & Restaurant Administration Quarterly, published August 2005. ^ Nestle, Marion (1994). “Traditional Models of Healthy Eating: Alternatives to ‘techno-food‘“. Journal of Nutrition Education. 26 (5): 241–45. doi:10.1016/s0022-3182(12)80898-3. ^ a b c Jayaraman, Saru (Summer 2014). “Feeding America: Immigrants in the Restaurant Industry and Throughout the Food System Take Action for Change”. Social Research. 81 (2). ^ Sibel Roller (2012). Essential Microbiology and Hygiene for Food Professionals. CRC Press. pp. ch 10. ISBN 9781444121490. ^ Danny May; Andy Sharpe (2004). The Only Wine Book You’ll Ever Need. Adams Media. p. 221. ISBN 9781440518935. Fierro, Alfred (1996). Histoire et dictionnaire de Paris. Robert Laffont. ISBN 978-2221078624. Gernet, Jacques (1962). Daily Life in China on the Eve of the Mongol Invasion, 1250–1276. Stanford: Stanford University Press. ISBN 978-0-8047-0720-6. West, Stephen H. (1997). “Playing With Food: Performance, Food, and The Aesthetics of Artificiality in The Sung and Yuan”. Harvard Journal of Asiatic Studies. 57 (1): 67–106. doi:10.2307/2719361. JSTOR 2719361. “Early Restaurants in America”. UNLV Libraries Digital Collections. University of Nevada Las Vegas. Retrieved April 30, 2013. Appelbaum, Robert, Dishing It Out: In Search of the Restaurant Experience. (London: Reaktion, 2011). Fleury, Hélène (2007), “L’Inde en miniature à Paris. Le décor des restaurants”, Diasporas indiennes dans la ville. Hommes et migrations (Number 1268–1269, 2007): 168–73. Kiefer, Nicholas M. (August 2002). “Economics and the Origin of the Restaurant” (PDF). Cornell Hotel and Restaurant Administration Quarterly. 43 (4): 5–7. doi:10.1177/0010880402434006. Whitaker, Jan (2002), Tea at the Blue Lantern Inn: A Social History of the Tea Room Craze in America. St. Martin’s Press.